To be honest, I actually don't love American-style fried chicken, with its thick batter. I would much rather have my chicken fried up Malay or Indonesian style, naked and perfumed with the scent of ginger and turmeric. Once I decided to put the two together, however, I realised that infusing the crispy batter with a boatload of spices makes for an incredibly addictive flavour and crunch explosion. Please, please try this at home, because this is probably going to be the best fried chicken sandwich you've ever tasted. This recipe owes a lot to The Food Lab, by J. Kenji Lopez-Alt, who is basically a food god, and who should be your go-to for all things meat, and American. First, make the spice mix by stirring the spices together until evenly mixed. In a mixing bowl, whisk the egg, buttermilk, 2 tablespoons of the spice mix and 1 tablespoon of salt together. Add the chicken and make sure each piece is coated. Leave the chicken to marinate in the fridge for at least 4 hours, but overnight is best. Before you fry the chicken, let’s make the sambal aioli and slaw. I find that an immersion blender and a measuring jug works best. Simply blend the mayonnaise, garlic clove, sambal belacan, lime juice, sugar and salt together until smooth. Toss 2/3 of the aioli with the julienned carrot and shredded cabbage. Reserve the rest of the sambal aioli for spreading onto the sandwiches. When you’re ready to fry, heat up the oil in a large pot or wok until it reaches 190C. It’s a really good idea to use a thermometer to monitor the temperature of the oil, so you get perfectly fried chicken. In a mixing bowl, whisk the flour, cornstarch, baking powder, 2 teaspoons of salt and the remaining spice mixture together. Using a pair of tongs, grab one piece of chicken, letting any excess marinade drip off. Dunk it into the flour mixture, and flip it around to make sure it’s coated really well. Transfer the chicken to a plate or rack, until you’ve finished coating all the chicken. Carefully place the chicken into the hot oil. You will probably have to do this in batches – just make sure the temperature of the oil doesn’t drop too much! Cook each piece of chicken for about 6 minutes in total, flipping them over from time to time. Transfer the fried chicken to a plate lined with kitchen paper, to allow any excess oil to drain off. 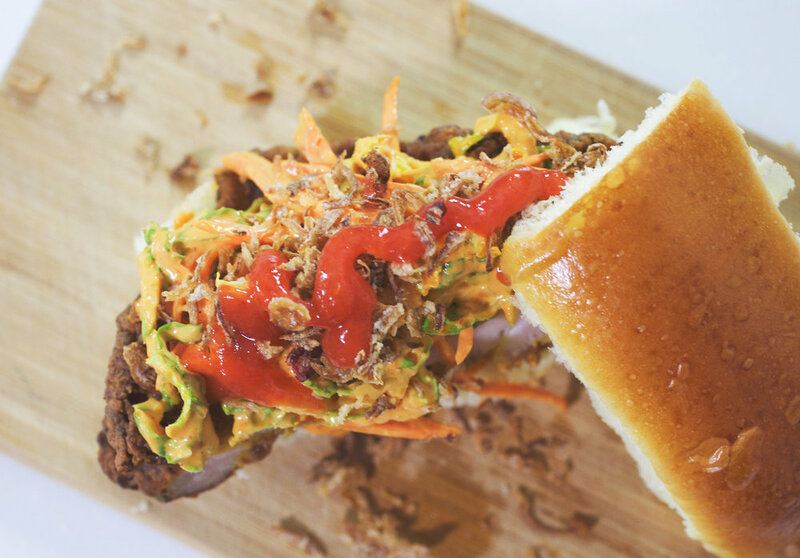 To assemble the sandwiches, spread some sambal aioli onto the bottom half of the bun. Top with the fried chicken, then some slaw. You can garnish with any of the possible toppings, such as fried shallots or extra chilli sauce before placing the top half of the bun on. Serve immediately!